Dr. Desmond DelGiacco, seated, is now senior medical director for clinical services and medical staff quality and education. Dr. Hung Dinh Nguyen, far right, is medical director of critical care. Longtime critical-care physician Desmond DelGiacco has taken on an expanded leadership role at Saratoga Hospital as senior medical director for clinical services and medical staff quality and education. Additionally, Dr. Hung Dinh Nguyen was named medical director of critical care, filling the position previously held by Dr. DelGiacco. A pulmonologist, Dr. DelGiacco’s contributions to critical care are acknowledged in the name of the hospital’s new, state-of-the-art Marylou Whitney and Desmond DelGiacco, MD, Intensive Care Unit. “Dr. DelGiacco has been the face of critical care in our community for over 30 years, and our ICU patients have benefited enormously from his knowledge and expertise. This new role extends his impact to all clinical services—and virtually every patient who turns to us for care,” said Angelo Calbone, Saratoga Hospital president and CEO. As senior medical director, Dr. DelGiacco will provide crucial support as Saratoga Hospital continues its evolution from a community hospital to a regional provider that offers services typically associated with larger medical centers. He will oversee the hospital’s medical education programs, which are being expanded in keeping with Saratoga Hospital’s position as an affiliate of Albany Medical Center, the region’s leading teaching hospital. Before the affiliation, Saratoga Hospital was a training site for students at Albany Medical College. 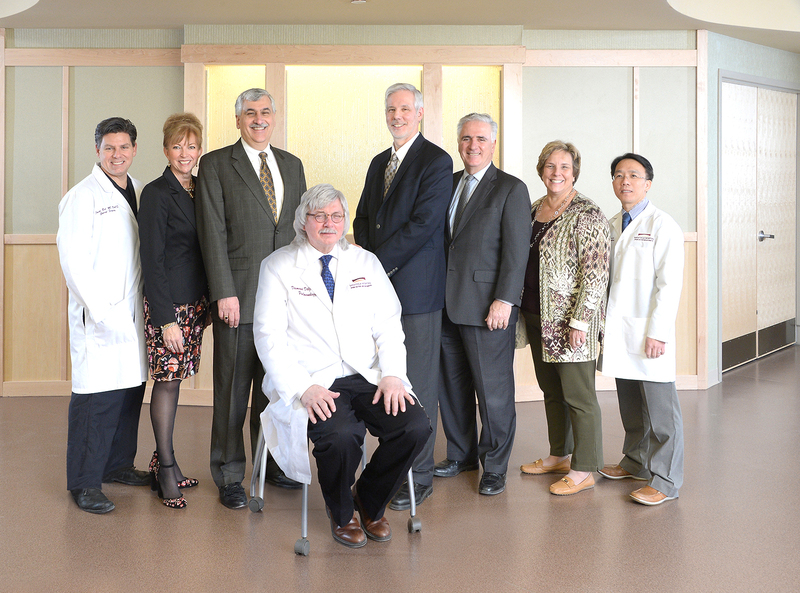 Now, Saratoga Hospital also helps educate residents in the college’s graduate studies program. DelGiacco joined Saratoga Hospital in 1981 and has earned a reputation for compassion, exceptional clinical expertise, and a willingness to share that expertise as a teacher and mentor. A graduate of Albany Medical College, he completed an internship and residency at Miriam Hospital/Brown University School of Medicine and a fellowship at Albany Medical Center. He is board certified in internal medicine with a subspecialty certification in pulmonary disease. DelGiacco remains in practice with Pulmonary Physicians of Saratoga. Also, he is medical director of Saratoga County Public Health Services and medical director of Saratoga County Chest Clinic. “It is a privilege to succeed Dr. DelGiacco as medical director of critical care—and to have the opportunity to build on such a wonderful program,” Nguyen said. Nguyen came to Saratoga Hospital in 2016 as director of Saratoga Hospital Medical Group – Pulmonary and Sleep Medicine. He also serves as head of the Saratoga Hospital Center for Sleep Disorders and director of the hospital’s lung cancer screening program. He completed an internship, residency and fellowship at Albany Medical Center, and accepted positions as a member of Albany Med’s Department of Pulmonary and Critical Care Medicine and an assistant professor at Albany Medical College. After joining Mohawk Valley Health System in Central New York, he returned to the Capital Region to take advantage of the growth and opportunities at Saratoga Hospital. He is board certified in internal medicine with subspecialty certifications in critical care medicine, pulmonary disease, and sleep medicine.